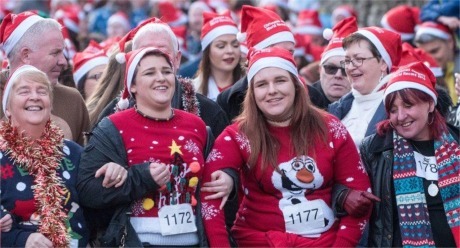 DERRY Mayor Alderman Hilary McClintock has praised the thousands of people who thronged the city centre at the weekend wearing all shapes, size and designs of Christmas jumper in a bid to break a world record. Event organisers are currently working with representatives from the Guinness Book of Records to collate the data and determine if they have broken the record for the most people wearing a Christmas jumper to be gathered in the same place. The current title is held by the city of Kansas, US., which managed to reach a whopping 3,743. An official announcement is expected later in the week but the real winners are the Mayor’s chosen charities which will now benefit to the tune of thousands of pounds. Tearfund and Action Cancer NI, as well as the Foyle Hospice, Concern, Muscular Dystrophy UK #TeamEvan and Children in Crossfire are the beneficiaries of the record-breaker attempt. “The record attempt clearly captured the public’s imagination and it was a brilliant sight to see the throngs of people make their way through the walls and into Guildhall Square and Waterloo Place,” said Cllr McClintock.